Seaborn Press is a small press works. And we have a small press that works! 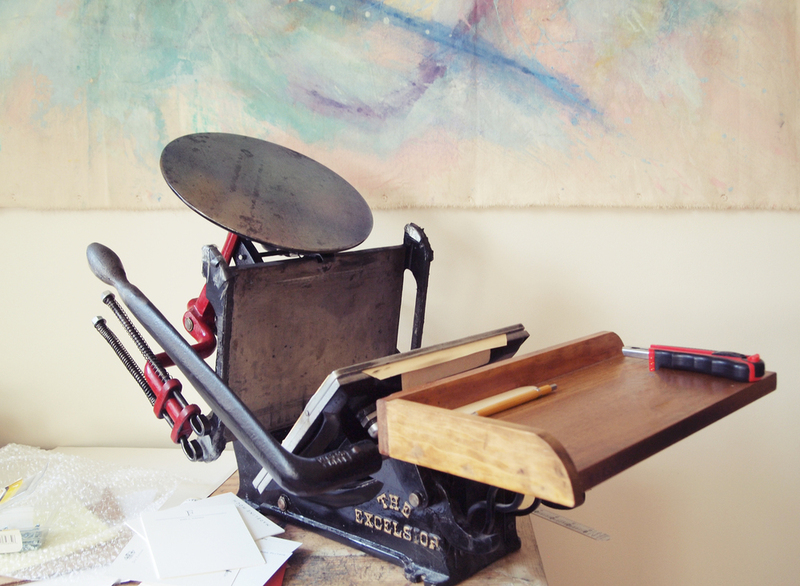 We're a small two-person team who founded our traditional printing studio upon our desire to create handmade stationery. Stationery we make with our hands that goes on to be used by your hands and then carried between two places via lots more hands. Even though we're well-versed in the digital world of design, we appreciate and admire time-honored crafts like traditional printing. That's why we only print with metal type - continuing a practice that stretches back hundreds of years. Letterpress printing with metal type allows us to slow down and be more directly involved in the process of making. We're not just a small press works because of our tiny staff - we print everything on our small press, too! Most commercial printers have big commercial presses. Our little shop is different. We have a small press and we've learned how to create designs that will be printed perfectly by that small press! Some might see a smaller press as limiting - but we've found that greater creativity lies within boundaries. Our small press is the backbone of our small press - and it works!